Joe Carnahan (THE A-TEAM, SMOKIN' ACES, NARC) delivers a raw, pure, man versus nature thriller that delivers on every level - empathetic, tense, emotionally affecting, beautiful, brutal. Based on a short story by Ian Mackenzie Jeffers, the movie follows a group of workers in the arse-end of Alaska. Their plane home crashes into the snowbound wildnerness, leaving the handful of "survivors" to battle against extreme cold and some hard-core mean wolves. Against such extreme stakes, we learn a little about their past lives, and a lot about their characters. We start to care about them just as it becomes clear that the Joe Carnahan is not going to pull any punches. A lot has been said about how this is a classic "man versus nature" epic, wrestling back Hollywood from the pretty boys. But to me, it played more like a character study set against some awesome landscapes and with a lot of genuine scares. Particular kudos to the cast of "B-listers" who add real pathos to the film - Joe Anderson, Dermot Mulroney, Frank Grillo, Nonso Anozie, and in particular Dallas Roberts (Alicia's brother in THE GOOD WIFE.) But no-one's going to deny that this is really Liam Neeson's film. His transformation from Irish character actor to Hollywood action hero is surprising until you see him in action. There is no actor who drips more integrity, competence, and - in a stunning final scene that drips into a post-credit shot - more bad-assery. I loved every minute of it. 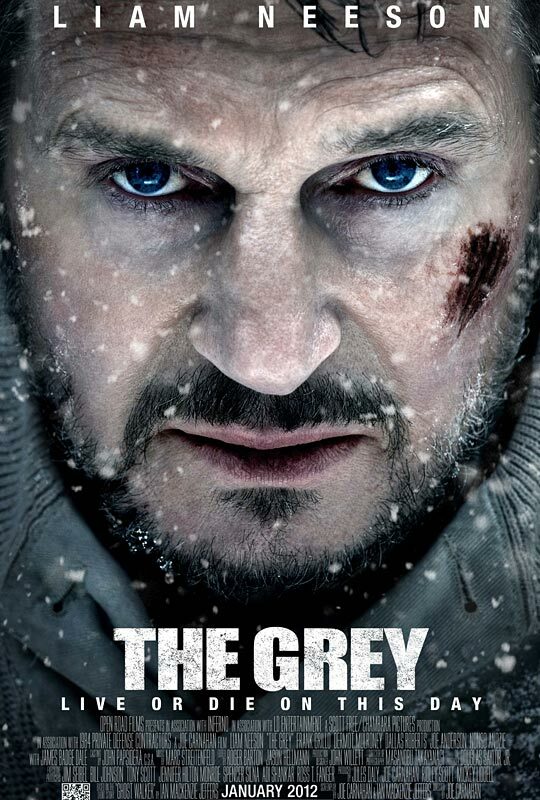 THE GREY was released this weekend in the USA, UK, Canada, Ireland and Turkey. It opens on February 3rd in Lithuania; on February 16th in Australia and Poland; on February 23rd in Belgium, Denmark, Singapore, Romania and Spain; on February 29th in France; on March 8th in the Netherlands; on March 20th in Norway; and on April 12th in Argentina and Germany.